1. With a sharp knife slit the hide circling the body behind the shoulder at approximately the mid-way point of the rib cage behind the front legs. Slit the skin around the legs just above the knees. An additional slit will be needed from the back of the legs (Figure 2A and 2B). 2. Peel the skin forward up to the ears and jaw exposing the head / neck junction. Cut into the neck approximately three inches down from this junction, Circle the neck cutting down to the spinal column. After this cut is complete, grasp the antler bases and twist the head off the neck. This should allow the hide to be rolled up and put in a freezer until transported to the taxidermist. 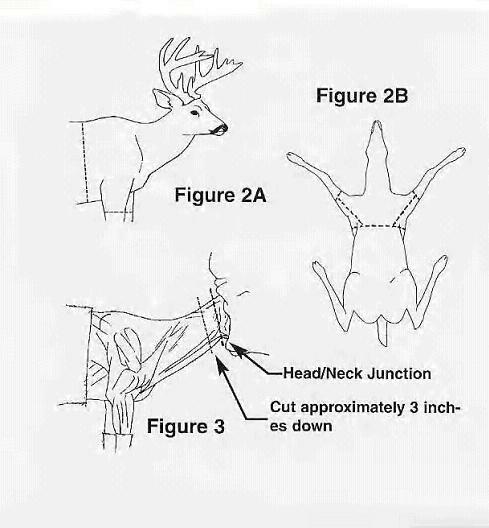 These cuts should allow ample hide for the taxidermist to work with mounting. Remember, the taxidermist can cut off excess hide but can't add what he doesn't have. Always have appropriate tags with your trophies when you take them to your taxidermist. Do not cut the ears for attachment. • Songbirds, Eagles, Hawks, and Owls are protected by Federal Law and can not be mounted unless with special Federal permit. 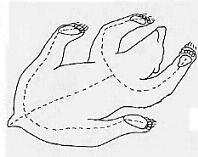 • For situation where you are hunting with no available taxidermist or freezer, ask your taxidermist about techniques to skin out the entire cape (including the head) and salting the hide. 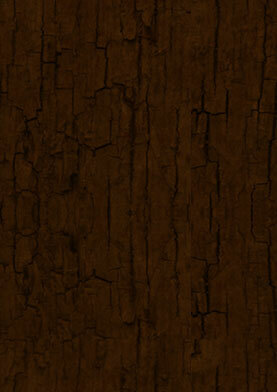 This is the only method in remote locations that can preserve your hide for later mounting.